I really need to get into the habit of charging a spare pair of batteries. Totally one of my bad habits. Sneak peaks will come... but not today. They are still a sneak if they are posted the day before upload, right? Mmmmm... love me a piece of lime tart. We had our first ever cypercrop last weekend over at The Scrappin Kats. Lots of fun with chat on Friday night, and Tracy set three fantastic challenges - the results posted in the gallery are amazing. Check them out here. This is my take on the sketch challenge. 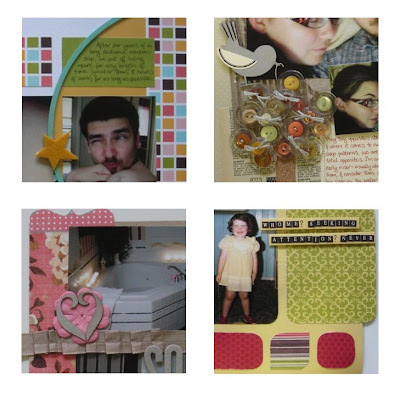 From the Stash: Bazzill swiss dot cardstock (love this! ); Bella patterned paper; RW chipboard circle (painted with MM paint); BG chipboard heart (painted with MM paint and covered in Pink Paislee glitter); MME transparency border; AC thickers; note paper; flowers; assorted buttons; white flourishes cut using mum's sizzix.